Pushing war and world hunger to the back of the line, the next important issue that technology is tackling is mismatched and missing socks. A company called Blacksocks has developed what it's claiming are the world's first smart socks that make them virtually impossible to mis-match, and incredibly easy to find in a basket overflowing with laundry. 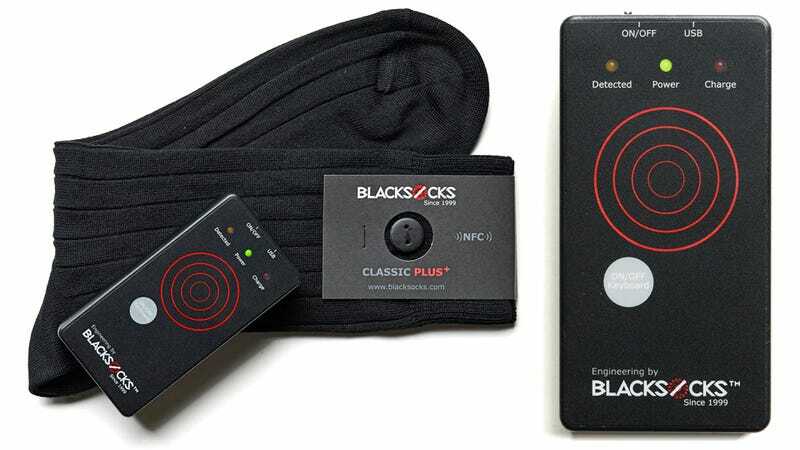 Spending $189 on ten pairs of boring black socks might seem a little outrageous, but that price tag includes RFID buttons sewn onto each one, and a handheld wireless detector that can be used to find each sock's proper mate—ensuring they all wear evenly over time. It can even be waved over a mountain of similar looking socks and will automatically beep when a given one's match is nearby. It's as much genius as it is ridiculously over-the-top.